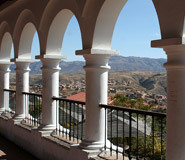 Discover Sucre during your price guaranteed Bolivia vacation. All of our Bolivia tours have daily departures and are fully customizable. Time seems to stand still in this pleasant city which functions as the constitutional capital of Bolivia. Early on in the Spanish colonial era, wealthy silver-mining families from Potosi, seeking refuge from the cold temperature of that high altitude town, retreated to Sucre to build their houses and estates. The city center today is a huge living museum, full of architectural treasures from the colonial and republican eras as well as numerous 16th century churches that feature Baroque and mestizo art. Nicknamed the White City for the gleaming buildings of the historical city, Sucre is featured on the list of UNESCO World Heritage Sites. 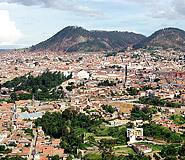 Widely considered to be the most beautiful city in Bolivia, Sucre is also one of the cheapest capital cities in Latin America, allowing you to enjoy all the conveniences of a large city at a budget price. The city center is full of interesting places to visit. La Recoleta is a former convent founded by Franciscan order in 1601 which also functioned as a barrack and a prison, and that now doubles as a church and museum. The church interior is notable for its intricate wood carvings and the museum has a gallery full of sculptures and paintings dating from the 16th to the 20th centuries, many of which represent St. Francis of Assisi. Casa de la Libertad is where Bolivian independence was declared in 1825. Today, the museum is the best place to learn about key events and figures in Bolivian history. Other sites within the historic center include the Museo de la Catedral with its chapel dedicated to the Virgin of Guadalupe, the Museum of Religious Art in the Santa Clara Convent, and the Iglesia de Santa Monica which hosts a fine collection of mestizo art. The former mansion of the wealthy Argandoña family, now known as the Castillo de la Glorieta, is another intriguing site located just a couple miles outside of Sucre. After an extended tour through Europe, Don Francisco Argandoña decided to build a castle-palace that reflected the various architectural styles he encountered overseas. The palace is picturesque, set amid gardens and surrounded by trees. Located 40 minutes from Sucre, Dinosaur Park (Parque Cretacico) is home to a full-size replica of a Titanosaurus as well as a mudstone wall with over 5,000 dinosaur tracks belonging to over a hundred different species. Facilities include a museum, restaurant, playground, and souvenir shop. You can visit Sucre during the whole year; the temperature tends to be cool year-round. The dry season (winter) lasts from May to October and is typically the best time for a Sucre tour. The rainy season lasts from December until March. There are no 5-star hotels in Sucre, but only 3- and 4-star premium class hotels. Contact a travel advisor at Latin America For Less for more information.